We’ve all seen the Roomba in action, whether it be on an infomercial or featured as a space-age mode of transportation in one of the thousands of pet videos on YouTube. When this futuristic was first introduced by iRobot back in 2002, it seemed like a dream-come-true. Could the days of the vacuuming finally be over? Over ten years later, and it’s pretty clear that this is far from the case. While the Roomba is certainly an amazing idea in theory, it simply doesn’t hold its own when it comes to actual performance, and here’s why. In order to keep it compact enough to slide under couches and other narrow spaces, Roomba makers had to sacrifice a lot of the suction power that other best-in-class vacuums boast. 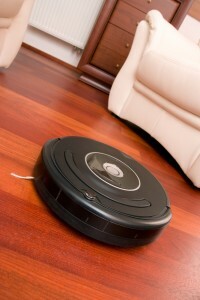 Unless your floor is already fairly clean, a Roomba is unlikely to do the job. And when it comes to plush carpets and shag rugs, the Roomba has little-to-no chance. The whole idea of the Roomba is that once you program it, you can let it do its things without lifting a finger. Unfortunately, this isn’t possible. Any time your Roomba encounters an unexpected object like a fallen item or an obstructed turn, it gets stuck. Not to mention impossible-to-scale stairs and those tight nooks and crannies. Yes, Roombas to use filters, but they’re nowhere near the caliber of the High Efficiency Particle Air filters used by other leading vacuum brands. This means that there’s a good chance you’ll experience a lot of discomfort if you have dust, pollen, or pet hair allergies and are using a Roomba. For something that can’t do a thorough job cleaning your house, the Roomba is very pricy. For a new model, you’re looking at around $600. You might be able to find an a used version for closer to $100, but odds are that this will be an older model without enough features to make it a worthwhile investment. Nevertheless, none of these cons are to say that you without a doubt shouldn’t buy the Roomba. If you want to get a head start on your household chores while at work and can afford it, then you might consider it more than worth it. If however, you’re looking for an easy alternative to a traditional manual vacuum, then the Roomba is not the option for you.